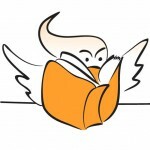 Michael Pryor is one of Australia’s most prolific and published authors, with 35 books and over fifty short stories to his name! 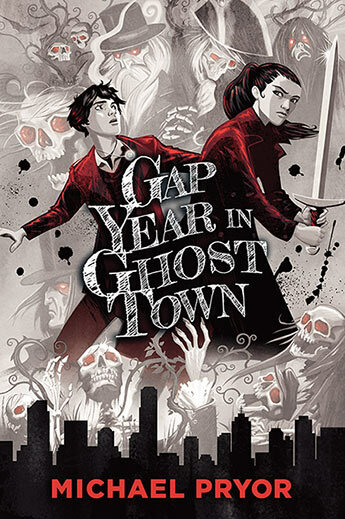 We recently caught up with him to discuss new book Gap Year in Ghost Town, and learn about the use and appeal of humour in YA writing. Tell us about your new novel, Gap Year in Ghost Town? This book is aimed fairly at YA readers. I wanted to write something that was funny and scary and pop culture aware. I wanted to write something with a main character who wants to do the right thing but is conflicted about it. I wanted to write something that draws on and acknowledges the amazing enthusiasm of fandom in all its incarnations. So, yes, it’s about ghosts and exciting stuff like that, but at its heart it’s about family and what it means. And the main characters are transitioning to adulthood, and they know it. They’re having to take on grown-up responsibilities, for better and for worse, in a modern world. You describe it as a comedy/adventure. Other than to make us laugh, what role do you see humour having in the novel? It’s a highlight thing, I suppose. Put black against white and the black is blacker and the white whiter. When an adventure is leavened with funny bits, the humour is more humorous and the danger is more dangerous. Win. Think Buffy The Vampire Slayer, North by Northwest or Raiders of the Lost Ark. Do you find young adults are particularly responsive to humour in books? When you think about it, young people often communicate with their friends using humour. Listen to them – they’re always joking around, bantering, attempting witticisms, puns and thigh slappers. They respond to it, too, in reading. So many of them ask for a book that’s funny, but trying to hit the right funny bone is a real challenge. Being funny demands all or nothing. If you try writing a romance and it’s not entirely successful, it can still be moderately romantic. When you don’t quite pull off a thriller, it can be moderately thrilling. But if you aim for funny and miss, then it’s not moderately funny – it’s unfunny, it’s a lead balloon, it’s irritating. Do you have any tips for budding writers on how to successfully include humour in a story? I like the unexpected so throw in something startling that takes the reader by complete surprise. A talking alpaca, for instance. And understatement is something that I think can be particularly appealing to Australian readers – ‘being pursued by a bloodthirsty ghost can take the edge off your day, sometimes’. Dry, self-deprecating, deadpan. It’s nice because it assumes the reader is smart enough to see what’s really going on, and so builds a useful connection between book and reader. Conversely, overstatement, the glorious exaggeration that everyone in the story knows is exaggeration, but they’re willing to go along with it for effect can really work. Then there are running gags – always loved by attentive readers, and banter between smart characters jousting verbally, playing with words, testing each other out can be so much fun. And don’t underestimate the power of pop culture references. They’re touchstones and quick ways of characterising moments in recognisable ways. It’s also a gesture of knowingness, of inclusivity. And I don’t mind a good pun, either. Just between us I’ve discovered a way to get away with them. Your character flags that they’re about to drop an awful pun, and the other characters react appropriately. 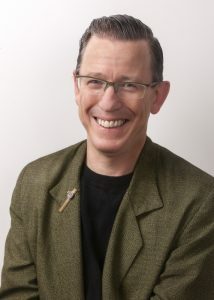 Michael Pryor is one of Australia’s premier Science Fiction and Fantasy authors. He has more than a million words in print, having published more than thirty-five books and over fifty short stories. Michael has been shortlisted seven times for the Aurealis Awards and seven of his books have been CBCA Notable Books. For more on Michael and his books, visit his website michaelpryor.com.au. Gap Year in Ghost Town is a smart, snappy, funny and scary ghost-hunting adventure. Anton Marin and his father, hereditary ghost hunters, are on high alert after a spike in ghost manifestations. Anton wants to help the ghosts. New girl in town, Rani Cross, wants to slice and dice them. And they both need to work together to keep the city safe.